We meet at the White Lion Beeston.3rd Friday of the month at 10-30. The content is 40 General Knowledge Questions and a Fun Quiz. Our Quiz sessions are intended to be enjoyable and fun. No one gets too serious about it. It’s just a pleasant 90 minutes for people who enjoy taxing their brain a little. No room fee but Sergio, the landlord, would appreciate purchase of tea or coffee. Everyone takes part in the Quiz, mainly in small groups. Easy questions with emphasis on fun. Come and join us. You will be most welcome. Small token prizes are awarded. Next date for your diary: December 15th. Dates for the Future, September 15th, October 20th, November 17th. December 15th. We are now into our 9th month of the Quiz. Numbers are increasing but new members are still very welcome. If you enjoy taxing your brain a little, then this is the Quiz for you. There are 40 General Knowledge Questions and a fun Quiz. Small prizes are awarded and we Quiz, mainly in small groups. Questions are easy with emphasis on fun. Come and join us. There is no room fee but White Lion would appreciate purchase of tea or coffee. Just drop in, see you there. Next meeting Friday June 16th 10-30. We are a friendly group who meet on the 3rd Friday of the month at the White Lion Beeston at 10-30. There are 40 General Knowledge Questions and a fun quiz. Our Quiz sessions are intended to be enjoyable and fun. No one gets too serious about it. It’s just a pleasant hour for members who enjoy taxing their brain a little. Everyone takes part in the Quiz, either alone or in small groups. Easy questions. Please come and join us, you will be very welcome. Just drop in. We now have an average of 15 members coming along to the Quiz sessions which are held in the Epworth Room on the second Tuesday of each month from 1.45pm to 3.30pm. Following the Summer break our next session will be Tuesday 10th September. Paper and pens are supplied plus some of the questions though now it has become a more interactive group with members contributing questions. We have individual and group rounds but no prizes. We play for the fun of it. New members always welcome. Our quiz group is going from strength to strength particularly since we have introduced individual inputs of questions from various members. Topics have ranged from Olympic Games to Science, Geography, History, Arts, Cooking, Music, Gardening, Boats and Planes and history of Newcastle. These inputs have come from Alan, Jane, Avril, Josie, Peter, Joan, Shirley, David, Jean and Gillian. I have also introduced a Bingo Quiz which combines general knowledge with an element of luck and this has been very popular. Other topics have included Only Connect – Word Games and lateral thinking plus spatial awareness graphics. The quiz meets every second Tuesday of the month in the Epworth Room, Chilwell Road Methodist Church at 1.45pm prompt till 3.30pm. Our next session is next Tuesday 8th January at 1.45 pm in the Epworth Room. Due to parties and holidays our numbers were a bit lower last session but we should be up to full total next week. It is my aim to involve each of you to take turns to ask group questions and we will continue to work in teams as this has proved to be most popular. This coming week I will start with 30 questions General Knowledge, then I have 20 questions on food which were used by a well known restaurant in their own Xmas Quiz and new member, Julia Powell, has compiled 20 Questions on famous lines from popular Films. Our team questions will involve the popular Only Connect and color link questions on topical and current issues – we will omit the spatial awareness type this time as some of you are still looking for those missing parts from last time ! Dates for your new diaries for the coming months. The Quiz Group are having a successful season with meetings taking place every second Tuesday of the month. We have about 16 members which is just right for the Epworth Room and new members are welcome to come along and join in the fun. The questions are varied and interesting designed to make you think and provide fun at the same time and members have also been keen to provide their own questions for the group. The format is evolving and I have changed the content as we have progressed through the months. I have put emphasis now on team work rather than on single type competitive questions and there are no prizes – members find this more relaxing and less stressful and more enjoyable! 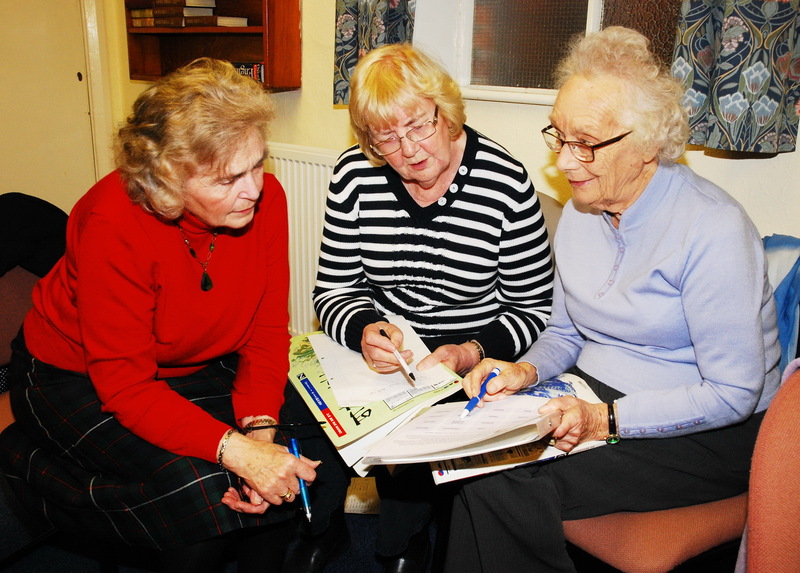 Our quiz group is flourishing with now 24 members meeting in the Epworth Room on the second Tuesday of each month. Meetings begin at 1.45pm for a prompt start at 2.00pm and end by 3.30pm. Group members also contribute to each quiz choosing 20 questions on a topic of their choice and I begin the meeting with 30 questions on general knowledge. The question format is evolving and the emphasis will change from an individual emphasis towards a more team sharing solving session. The emphasis will be on team enjoyment rather than on prizes etc. New members are joining each session so please come along and join in the fun. My contact number is 0115 925 2010. 10 July Douglas’ writes: I believe we had a good session this afternoon and we just managed to get through all the questions…there never seems to be enough time ! Also a warm welcome to all the new members and also a big thanks to Jean for her History questions. Next session on Tuesday 14 August. Carole will be providing us with 20 questions on Food and Drink. On Tuesday 18 September. Peter will be providing us with questions on his own specialist subject. I have a feeling it could be Gardening ! Although our room is virtually full, there were four missing today. Do tell your friends and invite them to come along as well. In discussion with all previous winners so far I have decided that for the next three meetings we will give the others who have not yet won a chance to becoming prize winners. After all it is the enjoyment of taking part that is my basic concern ! Also to congratulate John as our winner today with an excellent score of 44 out of 50. However at the moment I am in discussion with Long Eaton U3A to form a Quiz Group so that in the future we may have an actual social Quiz between the two groups. Also next time the group totals will also contribute towards the final prize ! Thanks again for being there at 1.45pm and this helps a lot with starting the session sharp at 2.00pm. 17 May Douglas writes: I’m pleased to note that the Quiz group is going from strength to strength and we have now enough to fill the Epworth Room. All meetings begin at 14.50pm for a prompt start at 2.00pm and will conclude at 3.30pm. The format will change as we progress but at present I start with general knowledge and the another member will do a short quiz on their chosen topic and I will conclude with a group quiz,In June Karin Williams will do a Music slot and in July Jean Evans will present History.Its all good fun so come and join us! 12 May 2012 Douglas writes: Pleased to inform you that as you know Karin has volunteered to compile a Music Quiz for next meeting in June and now Jean will do a History Quiz for July. These will be just 20 questions long and I’m assured will not be too difficult. So hopefully let me know if you would like to come forward to do similar quizzes for August and September. Just let me know by email or at the next meeting. Of course we will still have my general knowledge one to start with and a group session to complete the afternoon. Also, if you are coming to our Jubilee Indoor Party on 6th June, I have compiled a special Jubilee Quiz for that afternoon in collaboration with the organiser Jane Wild. Some members wished to have a copy of my quiz from Tuesday afternoon so that they could try it out with their friends and groups. You have my permission to use it yourselves and I feel its quite interesting. Especially when you can see the answers! Click on Quiz to see the details. Tues 18th September (3rd Tuesday). 19 April 2012, Douglas writes: Thank you all for coming along to our first session last Tuesday and I have attached a programme of dates from now up to and including December 2012. General consensus agreed that the second Tuesday of each month from 2.00pm to 3.30pm would be the best time to meet in the Epworth Room with a short break and we would would end the session at approximately 3.30pm as I realise that some of you are rushing off for buses etc. The fee for the room will be £1 per session to cover our actual cost of room hire and I have had very positive feedback from all those who attended our first session. I also realise that the room is fairly small particularly as the numbers may increase as I have added some members from the original list who were keen to join already. Being a diverse group with some of you like myself being in several other groups it could be difficult for you all to attend every session but don’t worry. Come to as many as you can fit in. I will keep the format basically the same but with some interesting variations. My overall idea is to make the session enjoyable for you and sometimes you will realise just how much you really do know. The emphasis is on fun and not to discover who is the top brain of all. Thanks too for Jim for coming along and giving us some moral support on our initial session.